Built-in china closets and antique china closets are popular features found in late Victorian and Arts and Crafts style homes. Such closets could usually be found in either the butler's pantry or formal dining room. They included shelves and storage areas for various serving pieces as well as tableware. The size of these china closets depended a lot on the affluence of the homeowner. A very wealthy family that entertained frequently might have a walk in closet that was specially outfitted to store their large collection of plates, platters and specialty dishes required by the elegant dinners typical of Victorian society and entertaining. A smaller home would be more likely to have a built in cabinet with shelves, glass doors, and drawers to store linens. If you have a historic home, you may have one of these china closets in the dining room or kitchen. In fact, since so many older homes have been remodeled, the closet may be in what is now a den or even a bathroom. The larger antique china closet may currently be a pantry, laundry area, hot water heater storage, or half bath. Restoring one of these areas back to its original purpose can be rewarding as well as adding the historic character back to your home. Built-in china cabinets were most often built into the wall between the butler's pantry and the dining room. They sometimes had sliding doors on the back wall of the cabinet to allow the freshly washed dishes to be added to the closet without having to walk into the dining room to do it. Since these storage cabinets were built in to the wall, they rarely were as ornate as standalone china cabinets and hutches. 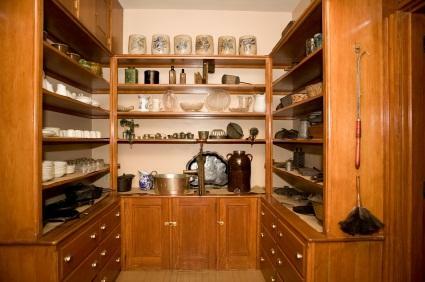 These utilitarian display cabinets met the necessary storage needs for the household's china, linens and silver. China closets built in the Victorian style are often taller and have a more elegant look than those that were built for Arts and Crafts bungalows. You will usually find the Victorian china cabinets built into corners rather than along a wall. You're more likely to find a build-in cabinet in larger Victorian homes built by the wealthy than a simple Victorian cottage. It wasn't until the Arts and Crafts movement that the built-in china cabinet became a common sight in most homes. These were recessed into the wall and could be quite long. Often the top shelf was used to display the homeowner's favorite pieces. The cabinets from this era have straight lines. The hardware is often hammered copper or metal and has a simple, handcrafted look. During the 1920s and 1930s, built in china cabinets became smaller and they took on classic Art Deco decorations like shells and scallops. These embellishments could be created by a plaster shell over the wood form of the cabinet. Sadly, when homeowners remodeled their homes in the mid 1900s, the old china closets were often removed and the space used for something else. If you own a Victorian or Arts and Crafts-style home built between 1890 and 1920, it is likely that it had some type of built in china closet. Look for a wide, shallow closet in your home near the dining room. It might have double doors to cover the wide opening that would have been left in the wall. If you can't figure out where it might have been you may be able to dig up the original blueprints to the house at your city's (or county's) archives department. Once you have a location for your antique china closet, you can try to find one that matches the style of your home. Spend some time looking at images of houses that were built within a year or two of when yours was; this can help you easily identify what the original closet looked like. Take the measurements carefully before you begin shopping. While you can easily add molding to a china cabinet that is a little too small you don't want to have to cut away a wall if you don't have to. You are most likely to find antique china closets at architectural salvage suppliers. You may have to visit often and keep looking for exactly what you are looking for. It is also a good idea to leave specific information about what you are looking for so that the company can call you if something comes along. Often homeowners put things for sale on Craigslist. You may be able to find a built-in china cabinet that fits your home right in your own neighborhood. Finally, if you can't find what you need, consider speaking to a local craftsman about recreating the china closet that was once in your home. Provide him with images from other historic homes and detailed information about what you want. Replacing architectural features in your home can be difficult, but ultimately it gives your house back its original vintage character and charm.